SIGH. Wendy, my woman. My fearless crusader for reproductive rights. That lady that I hope (but seriously doubt) will be the next governor of my beloved home state. Fire your creative staff. Seriously, every single one of them. 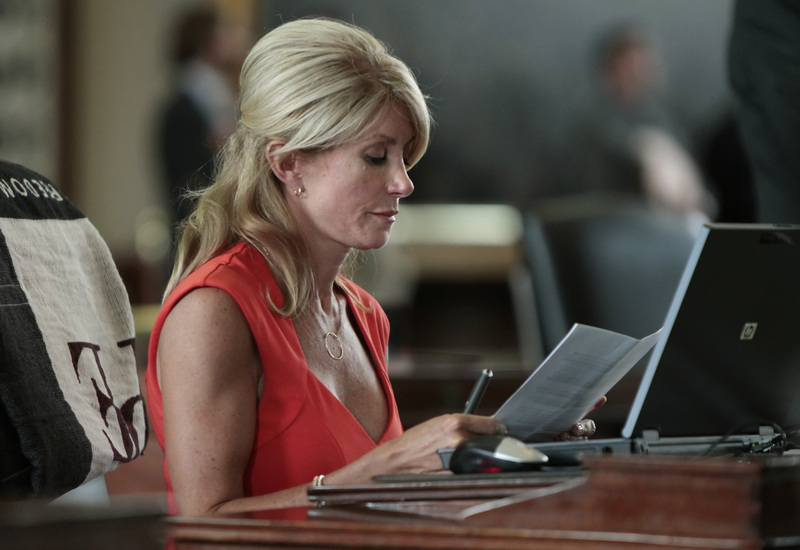 In case you're having trouble keeping up with her high-profile slip ups, Texas gubernatorial candidate Wendy Davis tweeted an remark about opponent Greg Abbott that launched a social media firestorm aimed at the already trailing Democrat. It started from an interview Abbott did with The San Antonio Express-News, in which he refused to answer if he, as the current attorney general, would have defended a now-defunct ban on interracial marriage as fervently as he has defended Texas' current gay-marriage ban. "I can’t go back and answer some hypothetical question like that," Abbott said in the interview. OK, sounds like pretty good ammunition for Wendy Davis' campaign, right? By punting the question, he is basically saying that he doesn't want to open himself up to picking and choosing issues to crusade against (i.e. the gays), which is pretty messed up. So let's grab the quote and work some Photoshop magic right quick, then blast it out to our massive social media following! And that is exactly what Wendy's team did. Buuuuuuut hold the phone, we've got a problem. Greg Abbott's wife of 30 years is Mexican-American, a ludicrously easy fact to uncover if you know how to use the popular search engine Google. So you can see how something like that would read like a personal rather than political attack. This is the same problem Davis had with her infamous wheelchair ad — it smacks of insensitivity, because on the surface it is extremely insensitive. You shouldn't use someone's disability or their marriage as political capital, both of which, on a surface level, it seems like Davis is doing. But if you look past the shock value, Davis is truly trying to expose Abbott's hypocrisy. Abbott's fight for tort reforms has made it nearly impossible to sue for medical malpractice in the state of Texas, a strange move from a man who benefited from the types of lawsuits he has now helped make all but impossible. And, sure, pointing out his refusal to say if he would reinforce a law banning marriages like his own seems out of line. But it is a fair question to people who looking for champions for marriage equality. Abbott has been vocal about his opposition to gay marriage, something that in the next 15 years — ***fingers crossed*** — will seems as ridiculous as your racist grandma. Just as ridiculous as a ban on interracial marriages seems to us today. I honestly get the idea behind Davis' social media jab, but you have to take the time to stop and think about it, and on social media that isn't the name of the game. I think her team needs to think a little more critically about how they attack Abbott, and if they insist on using his disability or his marriage, do it using clear, accessible terms. Because it's evident that something isn't working.